The YES Youth Club, established by Heifer Armenia and Development Principles NGO, recently held an Open Lesson for their younger peers to share their knowledge about caring for the environment. YES Club members in the Lernagogo community of the Armavir region, who took part in the ecology trainings and education, organized and conducted this lesson for schoolchildren aged 7-8. During the lesson, the children listened carefully to what the older students were teaching, and they enthusiastically asked questions. Seda Ghazaryan, a member of the ecology section of the Club, taught the children that they must care for the trees and other plants, water them, clear the garbage, never throw litter in the street, close the tap after using water, and turn off the light if they dont need it. The children were also taught to care for the animals and birds since they are the friends of people and belong to the very same nature people do. The children were assigned to draw nature the way they imagined, and the results were unbelievable. Some of the children drew people planting and watering trees. Others depicted forests and green, clean parks, and still others painted animals living happily with people. At the end the children said they enjoyed this lesson very much and the elder youth promised to organize similar lessons more often. The Youth Club members initiative was indeed interesting and praiseworthy. We hope that the younger generation who attend the Youth Club in the future will become as educated and as friendly with nature as Seda and her club-mates are. 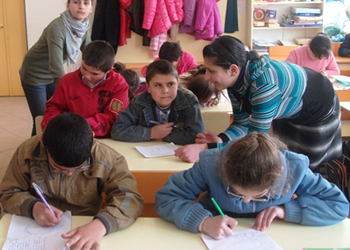 Learn how you can be a part of the exciting changes in Armenia through Heifer International.